A crew from Deady Landscape Construction worked on filling in a stretch of the sea wall on Cable Hill Way in Duxbury on Tuesday. With another storm on the way, several coastal communities are shoring up sea walls that were damaged by the pounding high tides during Friday’s nor’easter. In Marshfield, emergency repairs were made to the sea wall on Bay Avenue in advance of Wednesday’s storm. “The sea wall itself crumbled,” Marshfield Town Administrator Michael A. Maresco said. Maresco said crews worked during low tide and put in steel plates “to hold everything back.” He described the repairs as “critical,” given the timing of the upcoming storm that’s scheduled to arrive Wednesday. “It’s sort of a short window of time,” Maresco said. Maresco said he knew of six to eight homes that were flooded because of the sea wall breach on Bay Avenue. The sea wall on Ocean Street was also damaged, and he estimated that at least seven to nine homes were flooded there. 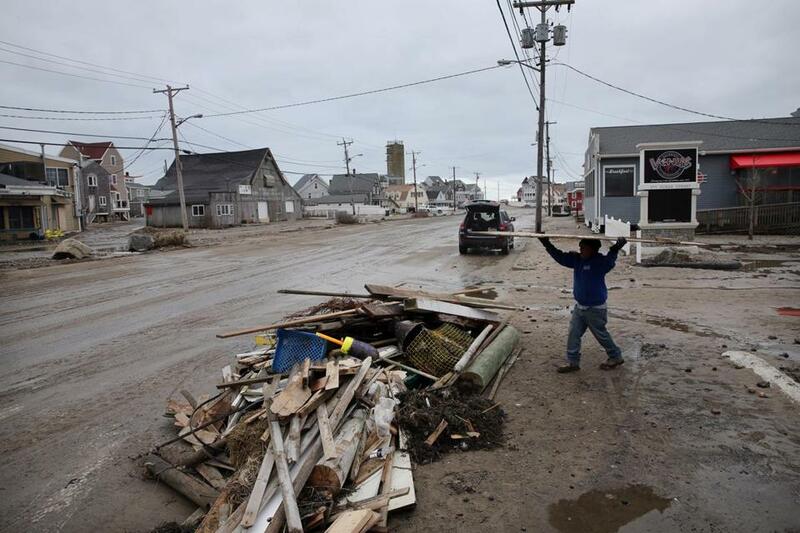 Chico Tomas worked on clearing debris at Venus II Restaurant & Sport Bar in Marshfield. The powerful surf pummeled one house on Ocean Street so hard that sea water went rushing inside the home. “The waves have been rolling into the house,” he said. Maresco said the price tag for fixing the sea walls probably will be in the “millions” of dollars. In the neighboring town of Scituate, a large piece of sea wall broke off on Surfside Road. Scituate Town Administrator Jim Boudreau said the section of sea wall measured between 25 and 30 feet long, and heavy stones were being placed there Tuesday. Boudreau said officials usually use a drone to survey the conditions of the sea walls in town, but it’s been too windy to send a drone up. He said officials have been looking at the base of sea walls and there are concerns about how they will hold up. “The sea walls took a real beating” during the last storm, he said. Scituate officials are still assessing the damage to property along the shoreline. Boudreau said homes in Humarock and homes on Oceanside Drive and Surfside Road appear to have been hit the hardest. Some had walls that caved in so it “looks like water went right through the houses,” he said. In Duxbury, the sea walls behind Ocean Road North and Cable Hill Way were compromised, and after high tide arrived around 2 p.m. Monday, the water got the best of them. “That’s when they went,” Duxbury Fire Chief Kevin Nord said. Duxbury fire officials tweeted Monday afternoon that “a huge section” of sea wall had collapsed into the ocean off Cable Hill Way. Nord said the section measured approximately 50 feet in length and sea water started to erode the cliff. 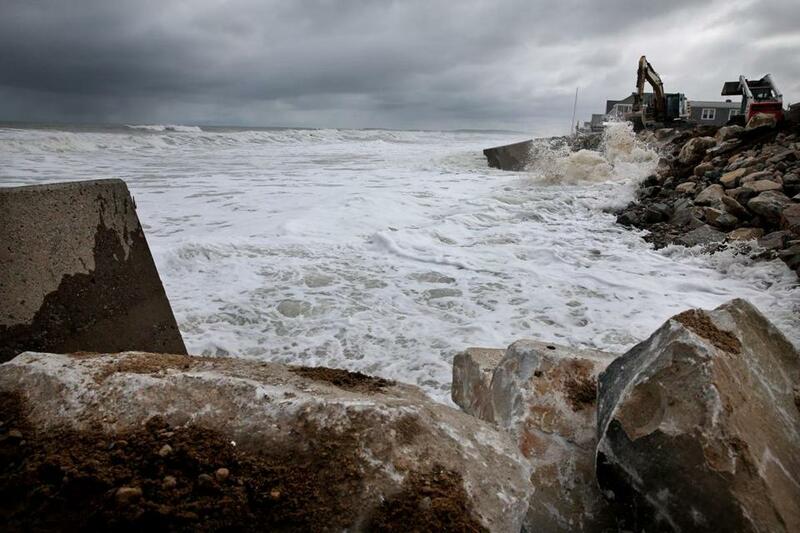 The sea wall behind Ocean Road North was also breached. 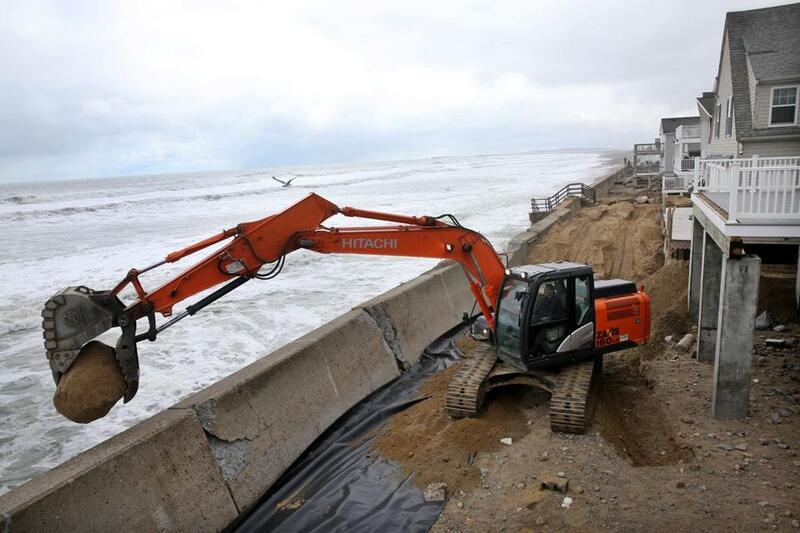 Crews worked on emergency repairs along the sea wall on Ocean Road North in Duxbury. On Tuesday, Duxbury fire Captain Rob Reardon posted video and photos of construction crews using excavators and truckloads of large boulders to stabilize the shoreline. “There is a tremendous effort to secure what remains of the sea wall behind Cable Hill Road and Ocean Road North in Duxbury,” he tweeted. “We have massive, massive destruction to our infrastructure here,” Read said.